This Wrox Blox introduces you to Visual Web Developer Express 2008 (think of this like Web Matrix on steroids!) and also goes over various Object Oriented Program (OOP) methodologies that you should be familiar with as you begin working with ASP.NET. While this Wrox Blox doesn’t cover actually building a working application, it touches on what n-tier architecture is and why it is a good idea to use it. Because ASP.NET is such a vast topic, you can’t possibly hope to cover everything in a single Wrox Blox, so, instead, you will create a very basic web site that will employ the most commonly found web-site features (connecting to a database, posting forms, and sending e-mail). 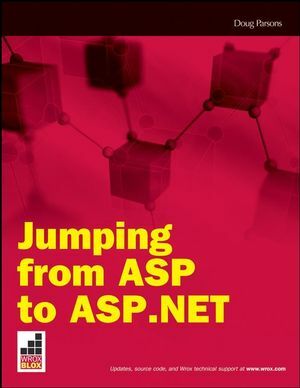 While making the jump from Classic ASP to ASP.NET 3.5 can seem like a daunting task, and while there is no automatic way to convert an existing Classic ASP web site over to ASP.NET, building a web site in ASP.NET from the ground up is very straightforward. To help make the conversion as easy as possible, you’re first presented with some Classic ASP code that you would have used to perform a given task, then shown the equivalent ASP.NET code as well as a discussion and explanation of the new code. Lastly, while most Classic ASP developers will be coming from a background strongly rooted in VBScript, this article uses C# instead of VB.NET throughout. However, this shouldn’t deter you in the slightest because it’s assumed that you have no prior knowledge of C# or of ASP.NET in general. Doug Parsons has been developing Internet applications since Classic ASP 3.0 was released and since then has been an early adopter on each release of the .NET framework. He is currently employed as an Advanced Internet Programmer with a company that provides Internet solutions for local, state, and federal government agencies and entities. To this end, he is currently part of the team responsible for maintaining and deploying the web site of United States Presidential hopeful John McCain. In his free time, he enjoys spending time with his wife and son, coding, playing video games, and helping users on the P2P forums.